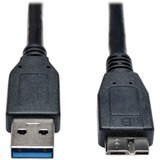 This USB 3.1 to HDMI adapter expands the potential of your tablet, laptop, Chromebook, MacBook, smartphone or PC's USB-C or Thunderbolt 3 port. 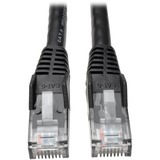 It's ideal for transmitting digital audio and 4K video to a large display, adding a thumb drive or other USB peripheral, powering and charging a PD Charging-compliant mobile device, and connecting to a Gigabit Ethernet network-all at the same time. 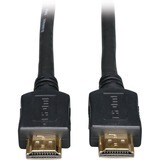 To send 7.1-channel surround sound and Ultra High Definition video to a 4K-ready HDMI television, projector or monitor, connect the HDMI port to the display using an HDMI cable (sold separately). 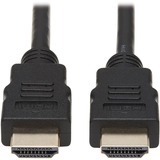 The HDMI port supports UHD video resolutions up to 3840 x 2160 (4K x 2K) at 30 Hz. 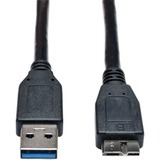 The USB-A port accepts USB peripherals, such as a flash drive, mouse, keyboard or printer. 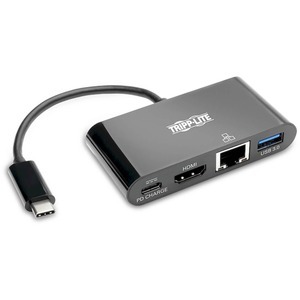 It supports fast USB 3.1 Gen 1 data transfer rates up to 5 Gbps and is backward compatible with USB 2.0 and USB 1.1 devices. 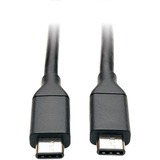 The USB-C Power Delivery (PD) port provides power and charging to the PD Charging-compliant device (such as a MacBook, Chromebook or Android smartphone) the U444-06N-H4GUB-C is connected to. Connect the device's AC wall charger to the USB-C PD port, which supports power input up to 20V 3A (60W). 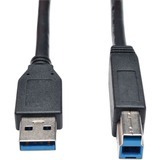 Tripp Lite USB 3.0 SuperSpeed Device Cable (AB M/M) Black, 10-ft.
Tripp Lite USB 3.0 SuperSpeed Device Cable (A to Micro-B M/M) Black, 3-ft.
Tripp Lite USB 3.0 SuperSpeed Device Cable (AB M/M) Black, 3-ft.